A man has been pictured dining alone with his late wife's ashes on Valentine's Day and has melted hearts around the internet. 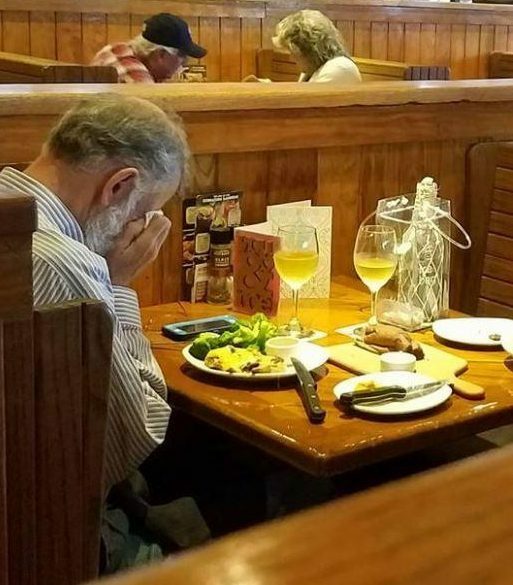 This is the viral photo of a grieving widower who was seen weeping into his hands as he sits down for a Valentine's Day meal with his wife's ashes. Absolutely heartbreaking, the tragic photo, which has gone viral online, shows the man holding a napkin to his face — while gifts for his late partner cover the table. It was taken by a heartbroken fellow diner who shared it to remind people to cherish their loved ones. Chasidy Gwaltney wrote: "Please love your sweetheart while you have the opportunity, you never know what tomorrow will bring or take away". She was having a lunch at a restaurant in Corpus Christi, Texas, when she noticed the man sat alone with heartwarming gifts adorning the table. But she soon realized that he was dining with his late loved one's ashes — and the emotional scene led her to take a photo. Although Chasidy's explanation has not yet been verified, she claimed the man was taking his departed wife for their annual Valentine's Day lunch date. She wrote: "You know? We are all guilty of taking our other half for granted from time to time. "We may forget to give a goodbye kiss, say I love you or just be so caught up in what we are doing at the moment that we don't notice the very little things that mean so much to our special someone. "I saw something today that has made me remember that we won't always have each other to hold, talk to, love, play with or even just aggravate every now and then. Chasidy added: "This picture speaks loudly and it may hurt your heart as it has mine. "This man looks like he is spending Valentine's Day alone at first glance but that is actually his wife in that very beautiful bottle sitting on the table. "Please love your Sweetheart while you have the opportunity, you never know what tomorrow will bring or take away!"